SNC's Dream Chaser test flight craft is hauled across the bed of Rogers Dry Lake at Edwards Air Force Base, Calif., to NASA's Dryden Flight Research Center on May 15, 2013. A private space plane has arrived at a NASA facility in California to undergo tests that will help vet its ability to ferry astronauts to and from the International Space Station. 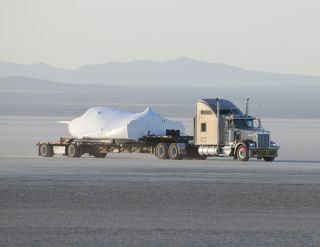 A test version of the Dream Chaser space plane arrived at NASA's Dryden Flight Research Center in southern California on Wednesday (May 15) aboard a flatbed truck, wrapped in a protective white caul for the overland journey from Colorado. A heavy-lift helicopter will also carry the vehicle aloft, allowing engineers to examine the loads the space plane will experience during flight. Such "captive-carry" tests will lead up to a free-flight trial planned for later this year, in which the Dream Chaser will return to Earth on its own after being released by the chopper. "This will be the first full-scale flight test of the Dream Chaser lifting body and will demonstrate the unique capability of our spacecraft to land on a runway," Jim Voss, vice president of space exploration systems at the Sierra Nevada Corp., which built Dream Chaser, said in a statement. "Other flight tests will follow to validate the aerodynamic data used to control the vehicle in the atmosphere when it returns from space," Voss added. "This is a huge step forward for the SNC and NASA teams towards providing our nation with safe and reliable transportation to the International Space Station." NASA's Dryden Flight Research Center welcomes SNC's Dream Chaser engineering test article for a flight test program in collaboration with NASA's Commercial Crew Program this summer. Image released May 15, 2013. Colorado-based Sierra Nevada is one of a handful of companies that hope to fly astronauts to and from the orbiting lab for NASA, which wants private American vehicles to fill the void left by the retirement of its iconic space shuttle program in 2011. SpaceX and Boeing are also in the running. Each is developing a capsule — in SpaceX's case, a manned version of its Dragon spacecraft, which has already completed two contracted robotic cargo runs to the station for NASA. Boeing calls its capsule design the CST-100. NASA hopes at least one of these commercial vehicles is up and running by 2017. Until this happens, the space agency will remain dependent on Russian Soyuz vehicles to fly its astronauts. The seven-passenger Dream Chaser looks a bit like a miniature space shuttle. It's about 29.5 feet (9 meters) long and has a wingspan of 22.9 feet (7 m). For comparison, NASA's space shuttle was 122 feet (37 m) long, with a wingspan of 78 feet (24 m). NASA chief Charles Bolden will be at Dryden next Wednesday (May 22) to get an up-close look at the Dream Chaser, space agency officials said.